For other uses, see Etna (disambiguation). "Mongibello" redirects here. Mongibello is also a fictitious location central to Patricia Highsmith's novel series The Talented Mr. Ripley and its movie adaptations, Purple Noon and The Talented Mr. Ripley (film). Mount Etna, or Etna (Italian: Etna [ˈɛtna] or Mongibello [mondʒiˈbɛllo]; Sicilian: Mungibeddu [mʊndʒɪbˈbɛɖɖʊ] or â Muntagna; Latin: Aetna), is an active stratovolcano on the east coast of Sicily, Italy, in the Metropolitan City of Catania, between the cities of Messina and Catania. It lies above the convergent plate margin between the African Plate and the Eurasian Plate. It is the highest active volcano in Europe outside the Caucasus. It is currently 3,326 m (10,912 ft) high, though this varies with summit eruptions. It is the highest peak in Italy south of the Alps. 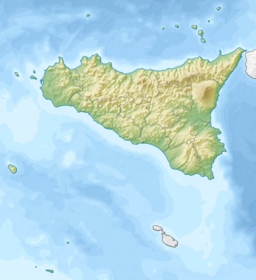 Etna covers an area of 1,190 km2 (459 sq mi) with a basal circumference of 140 km (87 miles). This makes it by far the largest of the three active volcanoes in Italy, being about two and a half times the height of the next largest, Mount Vesuvius. Only Mount Teide on Tenerife in the Canary Islands surpasses it in the whole of the European–North-African region west of the Black Sea. In Greek Mythology, the deadly monster Typhon was trapped under this mountain by Zeus, the god of the sky and thunder and king of gods, and the forges of Hephaestus were said to also be located underneath it. Mount Etna is one of the world’s most active volcanoes and is in an almost constant state of activity. The fertile volcanic soils support extensive agriculture, with vineyards and orchards spread across the lower slopes of the mountain and the broad Plain of Catania to the south. Due to its history of recent activity and nearby population, Mount Etna has been designated a Decade Volcano by the United Nations. In June 2013, it was added to the list of UNESCO World Heritage Sites. The word Etna is from the Greek αἴθω (aithō), meaning "I burn", through an iotacist pronunciation. In Classical Greek, it is called Αἴτνη (Aítnē), a name given also to Catania and the city originally known as Inessa. In Latin it is called Aetna. In Arabic, it was called جبل النار Jabal al-Nār (the Mountain of Fire). It is also known as Mungibeddu in Sicilian and Mongibello or Montebello in Italian (the Italian word literally means "beautiful mountain"). According to another hypothesis, the term Mongibello comes from the Latin Mulciber (qui ignem mulcet, "who placates the fire"), one of the Latin names of the Roman god Vulcan. Another theory is that Mongibello came from Italian monte plus Arabic jabal, both meaning "mountain." 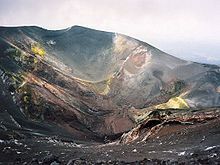 Today, the name Mongibello is used for the area of Mount Etna containing the two central craters, and the craters located southeast and northeast of the volcanic cone. The name Mongibel is found in Arthurian Romance, as the name of the otherworld castle (or realm) of Morgan le Fay and her half-brother, King Arthur, localised at Etna, according to traditions concerning them derived from the stories told by the Breton conteurs who accompanied the Norman occupiers of Sicily. What were originally Welsh conceptions concerning a dwarf king of a paradisal, Celtic underworld became attached to the quasi-historic figure of Arthur as "Ruler of the Antipodes" and were then transplanted into a Sicilian milieu, by Bretons impressed by the already otherworldly associations of the great, volcanic mountain of their new home. Mediaevalist Roger Sherman Loomis quotes passages from the works of Gervase of Tilbury and Caesarius of Heisterbach (dating from the late twelfth century) featuring accounts of Arthur's returning of a lost horse which had strayed into his subterranean kingdom beneath Etna. Caesarius quotes as his authority for the story a certain canon Godescalcus of Bonn, who considered it a matter of historic fact of the time of Emperor Henry's conquest of Sicily circa 1194. Caesarius employs in his account the Latin phrase in monte Gyber ("within Etna") to describe the location of Arthur's kingdom. The Fada de Gibel of the Castle of Gibaldar (Fairy of Etna) appears in Jaufre, the only surviving Arthurian romance in the Occitan language, the composition of which is dated to between 1180 and 1230. However, in Jaufre, while it is clear from her name that the fairy queen in question is Morgan le Fay, the rich underworld queendom of which she is the mistress is accessed, not through a fiery grotto on the slopes of Etna, but through a 'fountain' (i.e., a spring) – a circumstance more in keeping with Morgan's original watery, rather than fiery, associations, before her incorporation into the folklore of Sicily. For another Sicilian conception of the fairy realm or castle of Morgan le Fay – see Fata Morgana (mirage) re. an optical phenomenon common in the Strait of Messina. Volcanic activity first took place at Etna about 500,000 years ago, with eruptions occurring beneath the sea off the ancient coastline of Sicily. About 300,000 years ago, volcanism began occurring to the southwest of the summit (centre top of volcano) then, before activity moved towards the present centre 170,000 years ago. Eruptions at this time built up the first major volcanic edifice, forming a stratovolcano in alternating explosive and effusive eruptions. The growth of the mountain was occasionally interrupted by major eruptions, leading to the collapse of the summit to form calderas. Thousands of years ago, the eastern flank of the mountain experienced a catastrophic collapse, generating an enormous landslide in an event similar to that seen in the 1980 eruption of Mount St. Helens. The landslide left a large depression in the side of the volcano, known as 'Valle del Bove' (Valley of the Ox). Research published in 2006 suggested this occurred around 8,000 years ago, and caused a huge tsunami, which left its mark in several places in the eastern Mediterranean. It may have been the reason the settlement of Atlit Yam (Israel), now below sea level, was suddenly abandoned around that time. Mount Etna is moving towards the Mediterranean Sea at an average rate of 14 mm (0.55 in) per year, the massif sliding on an unconsolidated layer above the older sloping terrain. Eruptions of Etna follow a variety of patterns. Most occur at the summit, where there are currently (as of 2019)[update] five distinct craters — the Northeast Crater, the Voragine, the Bocca Nuova, and the Southeast Crater Complex (2). Other eruptions occur on the flanks, which have more than 300 vents ranging in size from small holes in the ground to large craters hundreds of metres across. Summit eruptions can be highly explosive and spectacular, but rarely threaten the inhabited areas around the volcano. In contrast, flank eruptions can occur down to a few hundred metres altitude, close to or even well within the inhabited areas. Numerous villages and small towns lie around or on cones of past flank eruptions. Since the year AD 1600, at least 60 flank eruptions and countless summit eruptions have occurred; nearly half of these have happened since the start of the 20th century. Since 2000, Etna has had four flank eruptions — in 2001, 2002–2003, 2004–2005, and 2008–2009. Summit eruptions occurred in 2006, 2007–2008, January–April 2012, in July–October 2012 and again in December 2018. The Roman poet Virgil gave what was probably a first-hand description of an eruption in the Aeneid. During the first 1500 years AD, many eruptions went unrecorded (or records have been lost); among the more significant are: (1) an eruption in about 1030 AD near Monte Ilice on the lower southeast flank, which produced a lava flow that travelled about 10 km, reaching the sea north of Acireale; the villages of Santa Tecla and Stazzo are built on the broad delta built by this lava flow into the sea; (2) an eruption in about 1160 (or 1224), from a fissure at only 350–450 m (1,148–1,476 ft) elevation on the south-southeast flank near the village of Mascalucia, whose lava flow reached the sea just to the north of Catania, in the area now occupied by the portion of the city named Ognina. Etna's most destructive eruption since 122 BC started on 11 March 1669 and produced lava flows that destroyed at least 10 villages on its southern flank before reaching the city walls of the town of Catania five weeks later, on 15 April. The lava was largely diverted by these walls into the sea to the south of the city, filling the harbour of Catania. A small portion of lava eventually broke through a fragile section of the city walls on the western side of Catania and destroyed a few buildings before stopping in the rear of the Benedictine monastery, without reaching the centre of the town. Contrary to widespread reports of up to 15,000 (or even 20,000) human fatalities caused by the lava, contemporaneous accounts written both in Italian and English mention no deaths related to the 1669 eruption (but give very precise figures of the number of buildings destroyed, the area of cultivated land lost, and the economic damage). Therefore, it is uncertain where the enormous number of fatalities can be attributed. One possibility is confusion between this eruption and an earthquake that devastated southeast Sicily (including Catania) 24 years later in 1693. A study on the damage and fatalities caused by eruptions of Etna in historical times reveals that only 77 human deaths are attributable with certainty to eruptions of Etna, most recently in 1987 when two tourists were killed by a sudden explosion near the summit. A large lava flow from an eruption in 1928 led to the destruction of a population centre for the first time since the 1669 eruption. The eruption started high on Etna's northeast flank on 2 November. Then new eruptive fissures opened at decreasing elevations down the flank of the volcano. The third and most vigorous of these fissures opened late on 4 November at an unusually low elevation, approximately 1,200 m (3,937 ft) above sea-level, in a zone known as Ripe della Naca. The village of Mascali, lying down-slope of the Ripe della Naca, was almost completely destroyed in two days. Only a church and a few surrounding buildings survived in the north part of the village, called Sant'Antonino or "il quartiere". During the last days of the eruption, the flow interrupted the Messina-Catania railway line and destroyed the train station of Mascali. The event was used by Benito Mussolini's fascist regime for propaganda purposes, with the evacuation, aid, and rebuilding operations being presented as models of fascist planning. Mascali was rebuilt on a new site, and its church contains the Italian fascist symbol of the torch, placed above the statue of Jesus Christ. 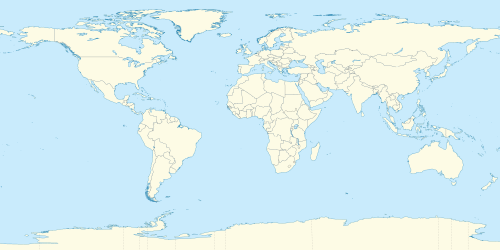 Other major 20th-century eruptions occurred in 1949, 1971, 1979, 1981, 1983 and 1991–1993. In 1971, lava buried the Etna Observatory (built in the late 19th century), destroyed the first generation of the Etna cable-car, and seriously threatened several small villages on Etna's east flank. In March 1981, the town of Randazzo on the northwestern flank of Etna narrowly escaped destruction by unusually fast-moving lava flows. That eruption was remarkably similar to one in 1928 that destroyed Mascali. The 1991–1993 eruption saw the town of Zafferana threatened by a lava flow, but successful diversion efforts saved the town with the loss of only one building a few hundred metres from the town's margin. Initially, such efforts consisted of the construction of earth barriers built perpendicularly to the flow direction; it was hoped that the eruption would stop before the artificial basins created behind the barriers would be completely filled. Instead, the eruption continued, and lava surmounted the barriers, heading directly toward Zafferana. Engineers then decided to use explosives near the source of the lava flow, to disrupt a very efficient lava tube system through which the lava travelled for up to 7 km (4 mi) without essentially losing heat and fluidity. The main explosion on 23 May 1992 destroyed the tube and forced the lava into a new artificial channel, far from Zafferana, and it would have taken months to re-establish a long lava tube. Shortly after the blasting, the rate of lava emission dropped, and during the remainder of the eruption (until 30 March 1993) the lava never advanced close to the town again. In 2002–2003, a much larger eruption threw up a huge column of ash that could easily be seen from space and fell as far away as Libya, 600 km (370 mi) south across the Mediterranean Sea. Seismic activity in this eruption caused the eastern flanks of the volcano to slip by up to two metres, and many houses on the flanks of the volcano experienced structural damage. The eruption also completely destroyed the tourist station Piano Provenzana, on the northeastern flank of the volcano, and part of the tourist station "Etna Sud" around the Rifugio Sapienza on the south flank. Footage from the eruptions was recorded by Lucasfilm and integrated into the landscape of the planet Mustafar in the 2005 film Star Wars: Episode III – Revenge of the Sith. The Rifugio Sapienza is near the site of a cable car station which had previously been destroyed in the 1983 eruption; it has now been rebuilt. Following a rather silent, slow and non-destructive lava outflow on the upper southeastern flank between September 2004 and March 2005, intense eruptions occurred at the Southeast Crater in July–December 2006. These were followed by four episodes of lava fountaining, again at the Southeast Crater, on 29 March 11 April 29 April and 7 May 2007. Ash emissions and Strombolian explosions started from a vent on the eastern side of the Southeast Crater in mid-August 2007. On 3 December 2015, an eruption occurred which climaxed between 03:20 and 04:10 local time. The Voragine crater exhibited a lava fountain which reached 1 km (3,300 ft) in height, with an ash plume which reached 3 km (9,800 ft) in height. The activity continued on the following days, with an ash plume that reached 7 km (23,000 ft) in height that forced Catania airport to shut down for a few hours. Volcanic gas emissions from this volcano are measured by a Multi-Component Gas Analyzer System, which detects pre-eruptive degassing of rising magmas, improving prediction of volcanic activity. An eruption on 16 March 2017 injured 10 people, including a BBC News television crew, after magma exploded upon contact with snow. An eruption on 24 December 2018, following a dyke intrusion at shallow depth, spewed ash into the air, forcing the closure of airspace around Mount Etna. Two days later, a magnitude 4.9 earthquake shook the nearby city of Catania, damaging buildings and injuring four people. In the 1970s Etna erupted smoke rings, one of the first captured events of this type, which are extremely rare. This happened again in 2000. Video footage of 8 June 2000 event was captured by naturalist filmmaker Geoff Mackley. Another event occurred on 11 April 2013. 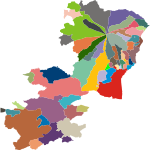 Map of municipalities in the province of Catania. Etna is one of Sicily's main tourist attractions, with thousands of visitors every year. The most common route is through the road leading to Sapienza Refuge ski area, lying at the south of the crater at elevation of 1910 m. From the Refuge, a cableway runs uphill to an elevation of 2500 m, from where the crater area at 2920 m is accessible. There are two ski resorts on Etna: one at the Sapienza Refuge, with a chairlift and three ski lifts, and a smaller one on the north, at Piano Provenzana near Linguaglossa, with three lifts and a chairlift. Sapienza Refuge was the finish of Stage 9 of the 2011 Giro d'Italia and Stage 4 of the 2017 Giro. ^ "Etna volcano". 19 February 2018. ^ "Etna & Aeolian Islands 2012 – Cambridge Volcanology". www.volcano.group.cam.ac.uk. ^ "Decade Volcanoes". United States Geological Survey. ^ According to Adrian Room’s book Place-names of the World, the name "Etna" originated from the Phoenician word attuna meaning "furnace" or "chimney". He dismisses the hypothesis that 'Etna' has a Greek derivation. "Volcano – Podictionary Word of the Day". Blog.oup.com. 29 April 2010. Retrieved 2 June 2011. ^ "Woodhouse's English-Greek Dictionary Page Image". Artflx.uchicago.edu. Retrieved 2 June 2011. ^ Bruce, Christopher W. (1999). The Arthurian Name Dictionary. Taylor & Francis. ISBN 0-8153-2865-6. ^ Loomis, Roger Sherman Wales and the Arthurian Legend, pub. University of Wales Press, Cardiff 1956 and reprinted by Folcroft Press 1973, Chapter 5 King Arthur and the Antipodes, pp. 70–71. ^ Loomis, Roger Sherman, Arthurian Tradition And Chrétien de Troyes pub. Columbia University Press, New York 1948, pp. 66 & 306. ^ Murray, J.B.; van Wyk de Vries, B.; Pitty, A. (April 2018). "Gravitational sliding of the Mt. Etna massif along a sloping basement". Bulletin of Volcanology. 80 (4): 40. Bibcode:2018BVol...80...40M. doi:10.1007/s00445-018-1209-1. ^ Tanguy, J. C.; Condomines, M.; Goff, M.; Chillemi, V.; Delfa, S.; Patanè, G. (2007). "Mount Etna eruptions of the last 2,750 years: Revised chronology and location through archeomagnetic and 226Ra-230Th dating" (PDF). Bulletin of Volcanology. 70 (1): 55. Bibcode:2007BVol...70...55T. doi:10.1007/s00445-007-0121-x. ^ The Encyclopaedia Britannica 5th edition (1817) quotes from the eyewitness report of Lord Winchelsea, Ambassador to Constantinople, to the Court of England. It happens not to mention casualties. Encyclopaedia Britannica: Or, A Dictionary of Arts, Sciences, and Miscellaneous Literature, Enlarged and Improved. Vol. 1 (5th ed.). Edinburgh: A. Constable. 1823. pp. 248–249. See also: Charles Hutton; Georges Shaw; Richard Pearson (1809). The Philosophical Transactions of the Royal Society of London, from Their Commencement, in 1665, to the Year 1800; Abridged...: From 1665 to 1672. 1. London. pp. 357–358, 383–387, 637–638. ^ "Etna and Man". Boris.vulcanoetna.it. Archived from the original on 22 July 2011. Retrieved 2 June 2011. ^ "press_text_booklet.indd" (PDF). Retrieved 2 June 2011. 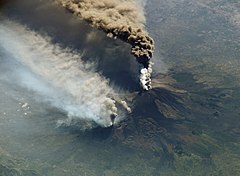 ^ "Italy's Mt Etna erupts - WORLD News". ^ Ken Kremer (15 January 2011). "Spectacular Eruptions of Mt. 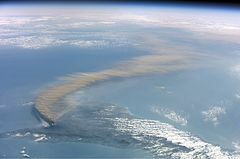 Etna in Sicily from Space and Earth". Universetoday.com. Retrieved 2 June 2011. ^ "INGV – Etna Observatory". Ct.ingv.it. Retrieved 2 June 2011. ^ "BBC News – Footage shows Mount Etna spewing lava and ash". Bbc.co.uk. 12 May 2011. Retrieved 2 June 2011. ^ Klemetti, Erik (3 December 2015). "Italy's Etna Unleashes a Short but Spectacular Eruption". Wired. Retrieved 3 December 2015. ^ "Etna volcano – eruption update". Volcano Discovery. 3 December 2015. Retrieved 3 December 2015. 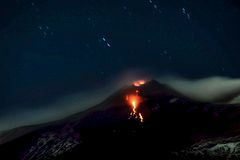 ^ "Etna show, nuova fontana di lava: non si ferma l'emissione di cenere". Corriere della Sera (in Italian). 4 December 2015. Retrieved 5 December 2015. ^ Aiuppa, Alessandro; Moretti, Roberto; Federico, Cinzia; Giudice, Gaetano; Gurrieri, Sergio; Liuzzo, Marco; Papale, Paolo; Shinohara, Hiroshi; Valenza, Mariano (12 May 2011). "Forecasting Etna eruptions by real-time observation of volcanic gas composition". Geology. 35 (12): 1115. doi:10.1130/G24149A.1. Retrieved 27 September 2016. ^ Balmer, Crispian (16 March 2017). "Volcanic explosion on Mount Etna injures 10 people". Reuters. Retrieved 16 March 2017. ^ "Mount Etna: BBC crew caught up in volcano blast". BBC News. 16 March 2017. Retrieved 16 March 2017. ^ "Mount Etna: 4.8-magnitude earthquake jolts Sicily". The Guardian. Rome. Agence France-Presse. 26 December 2018. Retrieved 26 December 2018. ^ "Terremoto 4 km NE Viagrande (CT), Magnitudo Mw 4.9, 26 dicembre 2018 ore 03:19:14 (Fuso Orario Italia) » INGV Centro Nazionale Terremoti". cnt.rm.ingv.it. Retrieved 23 March 2019. ^ "Global Volcanism Program: Etna". Smithsonian Institution, National Museum of Natural History. Retrieved 26 October 2016. ^ "SwissEduc - Stromboli online - Etna 2000". www.stromboli.net. ^ "Etna hoops it up". BBC News. 31 March 2000. Retrieved 9 October 2008. ^ "Erupting Mt. Etna coughs up a smoke ring". WJLA (ABC) Storm Watch 7. 16 August 2011. Retrieved 15 April 2013. ^ Geoff, Mackley. "Mt Etna – Sicily, Italy – the greatest show on earth !". Geoff Mackley. Retrieved 15 April 2013. ^ "Mount Etna blows smoke rings during volcanic eruptions". NBC News. 12 April 2013. Retrieved 15 April 2013. ^ Montoleone, Raul. "Stranezze geopolitiche: I comuni attorno all'Etna - GlobalGeografia". www.globalgeografia.com. "Etna". Global Volcanism Program. Smithsonian Institution. Retrieved 25 December 2008. Chester, D. K.; Duncan, A. M.; Guest, J. E.; Kilburn, C. R. J. (1985). Mount Etna: The Anatomy of a Volcano. Chapman and Hall. pp. 412 pp. ISBN 978-0-8047-1308-5. 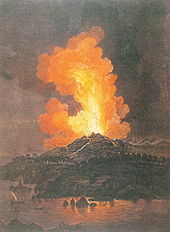 Wikimedia Commons has media related to Etna.